Do you love our classes but can't make it during the evening? Or perhaps you just like to start your day with a healthy workout. 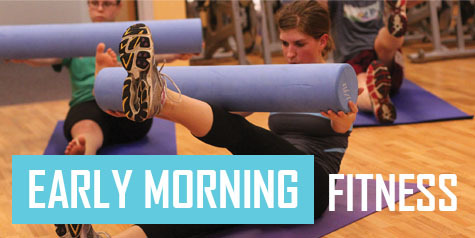 Starting March, we now offer early morning fitness classes for the early risers out there. BOOTCAMP: Join us to build the strength and endurance you need to climb better, harder and longer than you ever have. Check our schedule for a complete listing of our available fitness classes, morning or evening. Spring Break Camps are a fun and active way for young climbers of all abilities to spend their school breaks. Registration now open! ...READ MORE The Edgeworks Climbing Team wants to congratulate Kylee Beam for taking 11th at the ABS Nationals Competition in Colorado! ...READ MORE Climb late into the night during Late Night Saturdays. Starting in March, we're staying open until 10 PM on Saturdays.